People are complex. And that makes changing behaviors a vexing problem. People are motivated by different things at different points in time and what motivates someone today may not motivate them tomorrow. What engages one person may not engage another. And low employee awareness of the programs you’ve put in place to help your workforce make healthy behavior changes only makes the problem more complex. If you want your employees to participate in your programs and change behaviors, they’ve got to know your programs exist. At Virgin HealthMiles, we recently conducted a survey of employers and employees, and found more than half of employers believe their employees have a good understanding of their range of health and wellness benefits and how they can participate. Yet, only 41% of employees felt they had a good awareness of available programs. And fewer than 50% said they understood how to participate. Forward-thinking companies are looking across employee touch points to increase awareness and engagement with the different benefits they provide. One strategy companies are using to make employees aware of all the services they provide is to create and promote a distinct brand for their workplace health and wellness offerings. In fact, according to a 2010 study from Buck Consultants, more than 40% of employers have created a distinct wellness brand or identity in order to focus employees’ attention on wellness initiatives and promote participation. 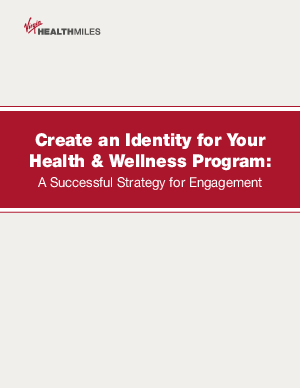 Branding your programs can help you increase program awareness, drive engagement, and in turn positively impact your employee’s health.